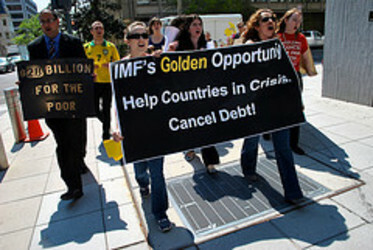 The IMF had $2.8 billion in extra cash from profits earned by selling some of its gold reserves December of last year. The IMF met to discuss what to use the excess money for. JubileeUSA along with other civil society groups called for the profits to be used to cancel the debt of poor countries. Melinda St. Louis, the Deputy Director of JubileeUSA Network said: "It's difficult to understand how some IMF directors would prefer to sit on and extra $3 billion for a rainy day fund for bureaucrats instead of helping poor countries weather natural disasters and food price shocks." The IMF already received a $7 billion endowment from gold sales and will bring in $500 million in profits this year from lending to poor countries plagued by crisis. 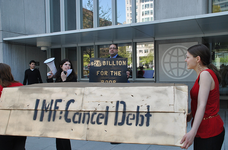 JubileeUSA Network along with nearly 60 other organizations around the world are calling on the IMF to use these extra profits to provide life-saving debt relief to help poor countries in crisis. To learn more about what JubileeUSA thinks about the IMF Gold Sales, Click Here. Update 2/24/12: IMF releases $1.1 billion for LICs. See the Press Release.